So it seems that my new thing is to bake small biscuits or cookies to take to gatherings. After hours of nibbling, drinking and eating BBQ, few people have the appetite for elaborate desserts or stodgy cake, but most can make room for a small cookie or two. 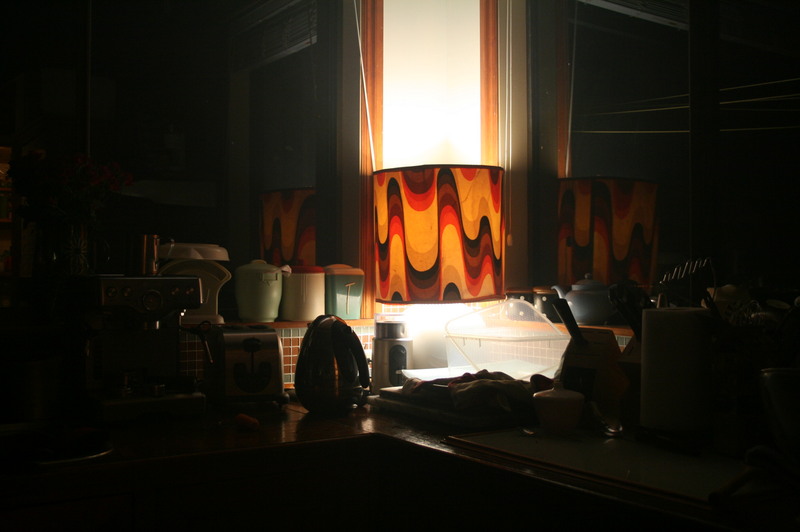 Last weekend we were invited to Jimmy and Meg’s place for a shindig. 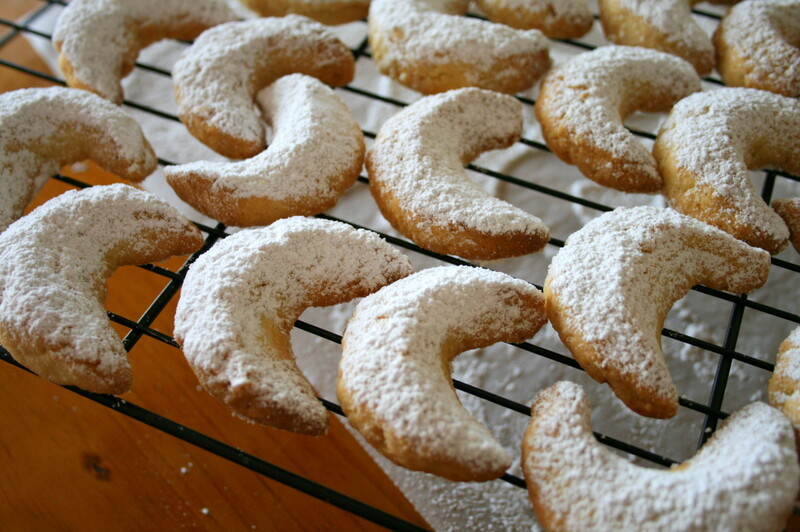 Asked to bring sweets, I decided to make little Almond Crescents that can be demolished in two toothsome bites. I first had these cookies at Mum’s place about 4 years ago – one taste and I just had to have the recipe. Mum had found the recipe on the Chelsea Sugar website, and not that long after I downloaded it and made them for a Hen’s party dinner. For some unknown reason I haven’t made them since, which is a serious oversight because they are good. The best thing about these cookies is their texture. They’re light and a bit crumbly from all that almond meal, and if you ensure a good proportion of small almond chunks, as I do, these will punctuate your cookies with little golden nuggets of toasty, oily nut. 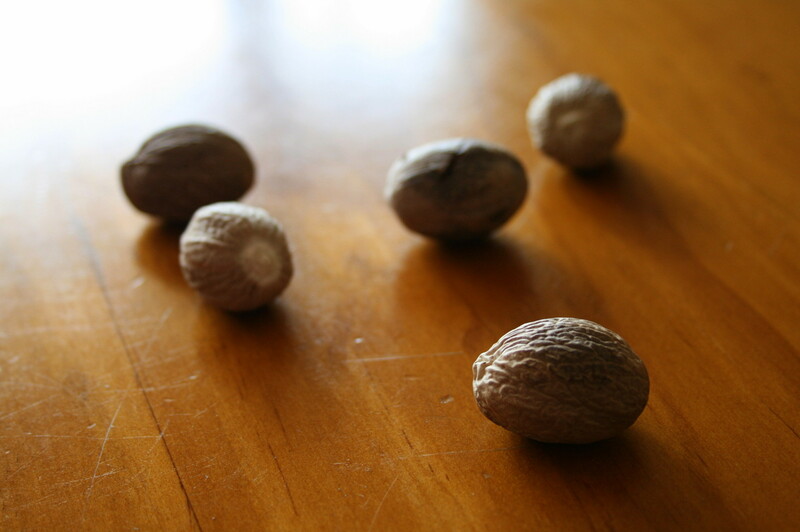 When freshly made, the star of the show has to be the nutmeg, whose spicy warmth subtly heats up your mouth as you eat. Within a day, if they last that long, the nutmeg mellows to a background richness, allowing the fragrant lemon zest to come to the fore. In either configuration they make a perfect after-dinner treat. 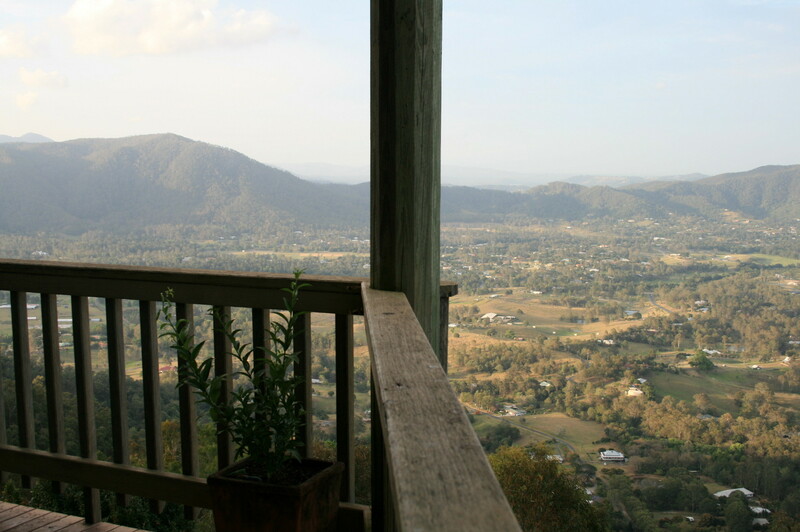 Jimmy and Meg’s funky retro house on the side of Mt Nebo provides stunning views across Samford Valley. We enjoyed a tasty BBQ on the deck, talked the night away with new friends, partook in an hours-long hoedown to some seriously good tunes, crashed on an airbed in Jimmy’s office, and had a slightly bleary drive home in the morning. Fun, fun, fun! 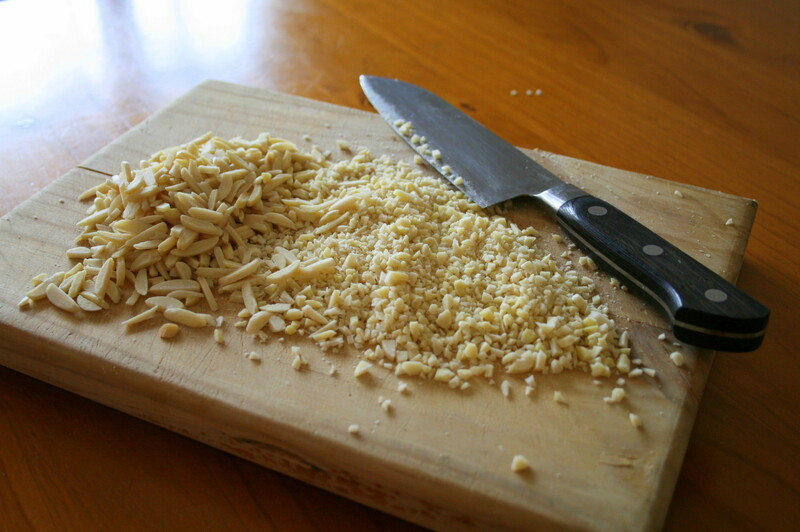 The easiest way to deal with all those almonds and get the perfectly textured mix is to place the almonds in a food processor and pulse to achieve a coarse grind. Be careful not to over-grind, as a lack of uniformity (small chunks of almond as well as some finely crushed) is pleasing in the finished biscuit. I don’t currently have a food processor, so I bought 200g slivered almonds and chopped them further, making up the other 120g with ground almonds that I already had in the fridge. Chopping is meditation, if you have the time to spare. Cream the butter, sugar and lemon rind with an electric beater until pale and fluffy. Add the egg yolk and beat again briefly. Add the flour, nutmeg and all of the almond and use a wooden spoon to bring the soft dough together. Once all ingredients are just incorporated (take care not to overmix), wrap the dough in plastic and chill for 30 minutes. Turn the oven on to 180°C/350°F to heat while you shape the cookies. Forming crescent shapes takes a little practice, but after you’ve made a few your fingers will know exactly what to do. My best tip is to use a tablespoon measure to portion off equal quantities of mixture. A standard tablespoon measures 15ml (or at least it does in most of the world, except, oddly, in Australia in which it is 20ml) which provides the perfect quantity of dough to make a small crescent. Roll the tablespoon of dough into a smooth cylinder about 2 inches tall, then using your thumb and forefinger, pinch, bend and pat the dough into a crescent shape. 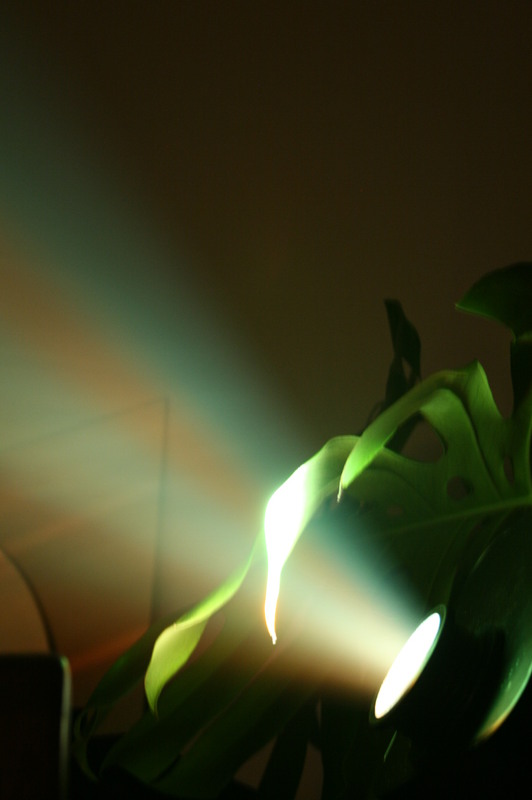 This is fiddly, but slightly hypnotic, and you will get faster. 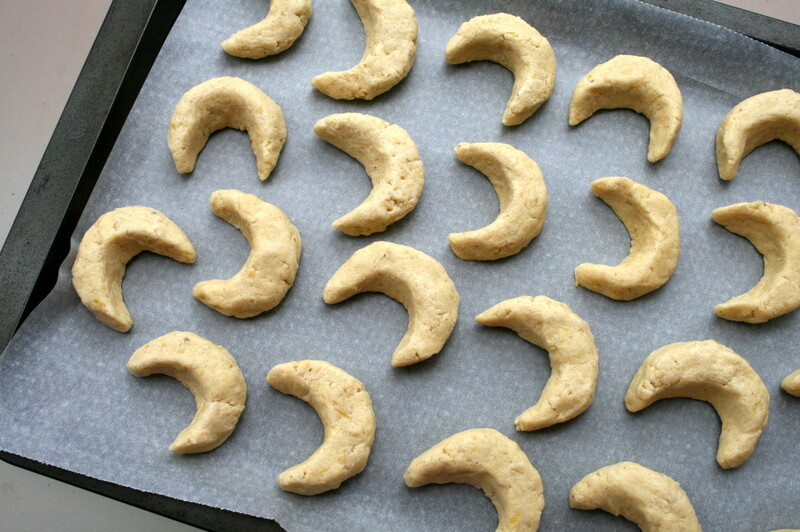 Place the crescents on a tray lined with baking paper and bake for 15-20 minutes until light golden all over – mine took 15 minutes, but your cookies may need longer if they are larger in size. As soon as you remove the cookies from the oven, use a sieve to sprinkle them liberally with icing sugar. The heat will melt the sugar slightly, adhering it to the cookies. Allow them to cool for a few minutes on the baking paper, and then transfer to a rack to finish cooling. The cookies need to be kept in an airtight container in order to stay crisp. We make similar delicious treats for xmas – we also use walnuts 🙂 They look amazing! I’ve made these before too and agree that they’re seriously delicious. Your ones look so even and perfectly formed…I’ll just have to try again! They’re great Xmas gifts – great little thank you treats at a busy time of year. Thanks! Yes there is something very christmassy about them, maybe because they are a bit fiddly to make – definitely not for everyday. You’re becoming seriously decadent, aren’t you! It could be my aim in life! Thanks lovely! Let me know how they turn out.